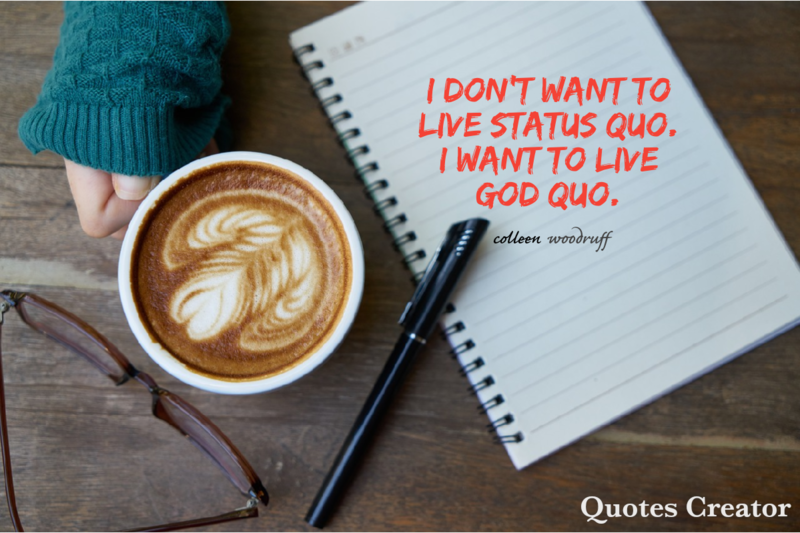 What’s your quo? No really. What is it? Think about it. Is it normal? Do your eyes see only the run of the mill reality of life? Maybe it is overwhelmed? Children? You fill in your life happenings. We cannot serve two master (Matthew 6:24). Many of us understand this but in reality we fight it, because we want both. We want God and everything else. We want a full time God while we are part time or grow complancent. It doesn’t work. I will be the very first person to raise my hand in agreement including myself with everyone else that we are not perfect creeters on this side of heaven, but we are gloriously saved sinners! We are saved by grace through God’s incredible love for us that we should intensely strive to please our Lord in every area of our life — and therefore end up not living the status quo! Yes, I will prayerfully do so. Thank you for your kind words.